On this date in 1940 in Berlin, one day before receiving the credentials of the new Soviet am­bas­sador to Germany, Adolf Hitler signed Fuehrer Direc­tive 21, Opera­tion Bar­ba­rossa (Unter­neh­men Bar­ba­rossa), thereby ini­ti­ating the secret pre­pa­ra­tions and mili­tary opera­tions that led to the Axis inva­sion of the Soviet Union on June 22, 1941. The armed forces of Ger­many, it stated, must be pre­pared, even before the con­clu­sion of the war with Eng­land (which had entered the war against Ger­many six­teen months earlier), to anni­hi­late the Soviets mili­tarily in a lightning cam­paign. For that to happen the plan called for the attack along an 1,800‑mile front, using more troops (even­tually 4.5 million), artil­lery pieces (46,000), tanks (3,350), air­craft (4,389), and horses (750,000) ever to be un­leashed on an oppo­nent. Opera­tion Bar­ba­rossa is im­portant for three reasons. First, it was the single largest land battle in his­tory. Secondly, had Bar­ba­rossa succeeded, the Third Reich would have scooped up huge tracts of the Soviet Union’s heavily popu­lated and agri­cul­tural heart­land, its oil-rich Cau­casus, and the greater part of its stra­te­gic in­dus­tries. The Nazis believed that it was only by grabbing the human and raw mate­rial and finished resources of a large eco­no­my like the Soviets’ could Ger­many com­pete, even sur­vive as a great power, against other great powers, espe­cially the United States, which for the mo­ment remained neu­tral in the global com­pe­ti­tion between Western demo­cracies and total­i­tarian states repre­sented by Ger­many, Italy, and Japan. Thirdly, the botched out­come of Bar­ba­rossa marked the begin­ning of the end for Hitler’s Ger­many. In German casualties alone, ninety-five per­cent occurred on Soviet soil between 1941 and 1944. Nota­ble Wehr­macht fai­lures to take major cities like the Soviet capi­tal Mos­cow, Stalin­grad (today’s Volgo­grad) on the Volga River, and Lenin­grad on the Baltic coast drove up the casu­al­ty count on both sides. Sixty-five per­cent of all Allied mili­tary casu­al­ties were incur­red by the Soviets either in trying to expel and destroy the Axis ene­my or in Ger­man POW camps, where most of the three mil­lion Soviet pri­soners were delib­erately starved to death as part of the Hunger­plan (Star­va­tion Plan), a policy of mass mur­der devel­oped con­currently with Oper­a­tion Barba­rossa, in order to feed both the in­vading German army and the population back home. 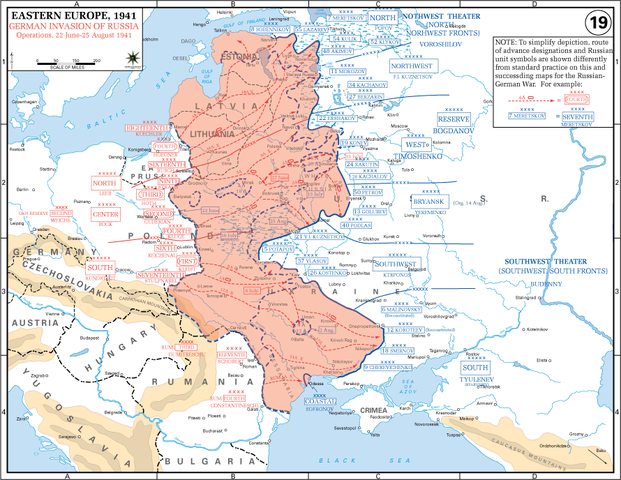 Above: Operation Barbarossa, beginning on June 22, 1941, was the code name for Ger­many’s inva­sion of the Soviet Union. It marked the beginning of the pivotal phase in deciding the victors of the war. During the first few months of the inva­sion, the Ger­mans won resounding vic­tories and occupied some of the most impor­tant econo­mic areas of the Soviet Union. Their Blitz­krieg approach to war­fare on the East­ern Front included geno­cidal practices to deci­mate a “racially inferior” population through planned mass starvation. 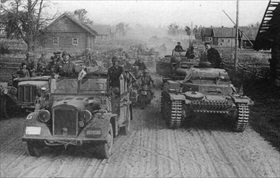 Left: The 3rd Panzer Group under Col. Gen. Hermann Hoth, part of Army Group Center (Heeres­gruppe Mitte), rolls through present-day Belarus near Pruzhany, June 1941. Army Group Center, one of three Ger­man armies attacking the Soviet Union, encircled Red Army forces around the Belarus capital Minsk, a key stra­te­gic rail­way junc­tion and a defen­sive posi­tion on the main road and rail line to Moscow, the Soviet capital. During the Battle of Białystok–Minsk, Army Group Cen­ter threw back all major counter­attacks and break­through attempts, killing and cap­turing 341,073 Soviets and advancing into the Soviet Union so quickly that many observers believed the Germans had effectively won the war. Right: Soviet equipment that fell into German hands in the early days of Opera­tion Bar­ba­rossa. 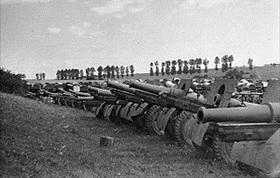 According to Soviet archives, the Red Army lost 20,500 tanks and 21,200 air­craft. Out of a total 4.7 mil­lion Soviet casu­al­ties, irre­cov­er­able man­power losses were over 3.1 million, of which over 2.3 million per­sons were listed as missing in action. Ger­man equip­ment losses were put at 3,827 air­craft and 2,839 Ger­man tanks. Ger­man man­power losses per army (Heer) medi­cal reports were 802,458 killed, wounded, or missing in action and (according to Red Army reports) 11,000 prisoners of war. 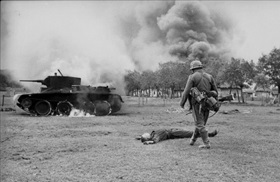 Left: German infantryman in front of fallen Soviet tank soldier and burning BT‑7 light tank in the south­ern Soviet Union during the early days of Opera­tion Bar­ba­rossa, June 1941. Army Group South’s princi­pal objec­tive was to cap­ture Uk­raine and its capi­tal Kiev. Ukraine was a major cen­ter of Soviet indus­try and mining and had the good farm­land required for Hitler’s plans for Lebens­raum (“living space”). The success­ful opera­tion (the First Battle of Kiev) ran from August 23 to Septem­ber 26, 1941. Soviet losses were 700,544 overall. 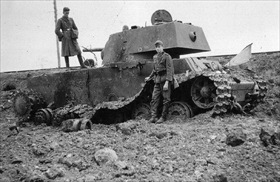 Right: German soldiers with a destroyed Soviet KV‑1 heavy tank near Kaunas, the second-largest city in Lithu­ania, June 1941. The tank may be one of over 700 tanks destroyed during the Battle of Raseiniai (June 23–27, 1941) by Army Group North, under Field Marshal Wilhelm Ritter von Leeb, en route to Lenin­grad. The result of the battle was the almost com­plete destruc­tion of Soviet armored forces of the North­western Front, which was involved in heavy fighting in the Baltic Republics and on the approaches and the outskirts of Leningrad, the Soviet Union’s second‑largest city.